Next session I’m going to let the fate of the dice fall as they may and see what happens, hope I don’t piss too many people off. What do you guys think? 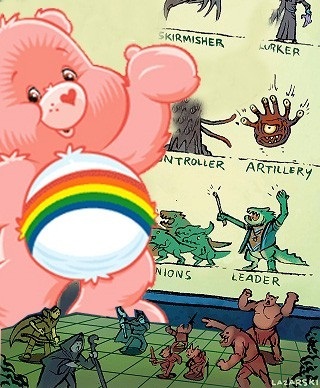 Are there any other carebears out there? Should I start a carebear DM support group? I like the term, nice writing also. I think it’s okay at some point to let your players sweat. The dice are there to decide the outcome. Even if someone dies outright because of bad luck, well – it’s a game and I don’t think you’d spoil the fun by playing what the dice decides. This all falls HEAVILY on group dynamics but I warn you, don’t do a Joss Wedon and kill off Wash just because the fans are getting comfortable with the characters. It’s been said that suffering is good for the soul. I’m not entirely convinced of that, but it IS good for your campaign’s story. Since you clearly don’t want your players to suffer (we’re all at the table to have fun), their characters should suffer for them. That means that sometimes a character will fail a skill roll, be knocked unconscious, or even die. Just make sure that you turn it into a memorable event. If a character dies it should feel like a pivotal moment in the battle. If a character fails a skill roll, well if your group is anything like mine that’s when hilarity will ensue! The bottom line, for me anyway, is that in all my many years of gaming I don’t remember how many kobolds I slaughtered, or stealth checks I succeeded at, but I will always remember the time my adventuring party went down in a blaze of glory between an army of Drow, a red dragon, and a village of angry farmers .We had been spectacularly stupid, and we deserved it. I try to only fudge dice when the party’s really doing badly. Let them feel like they just scraped by, but I don’t know if I could honestly TPK a group unless I had something in mind. @mrfb Yeah, I think this is the method I'm going to lean towards, as long as they don't always think there will be some circumstance that allows them to escape by the skin of their teeth. I'll have to avoid getting into that habit as well. I took away my GM screen. I put all the tables and charts I used from it in the first few pages of my GM notebook, and literally rolled the dice in front of my players’ faces. All of the dice. 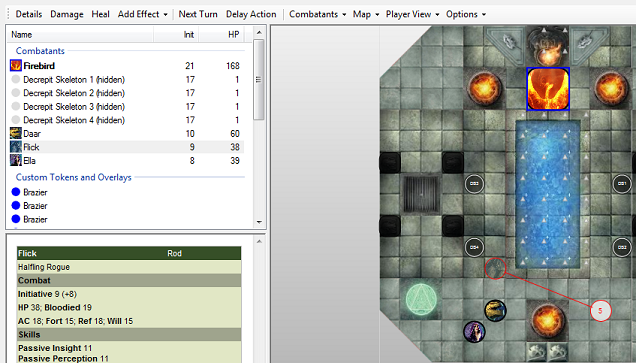 Every attack roll, saving throw, power recharge, and most *especially* damage roll– right in front of them. And you know what? They got scared. But in a good way, knowing that the gloves had come off and that not only was I not fudging rolls anymore, but that I physically *couldn’t*. It freed me up, really, to not shoulder the burden of keeping them alive, and I still had the choice of altering a monster’s decisions or adding/removing creatures if I really wanted to change things, but I found that so long as I kept to the 4E design theories, VASTLY more fun was had by all, myself included.